“I have never missed the last day of school,” said longtime teacher Tonyus Chavers, but this time she has a very good excuse. 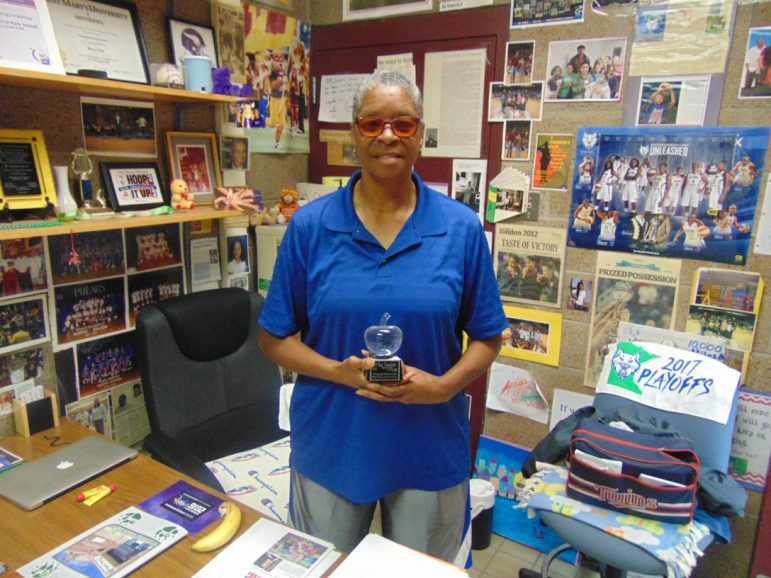 The Richard Green Central Elementary physical education teacher is heading to Knoxville, Tenn., where she will be inducted into a class of her own – the Women’s Basketball Hall of Fame. On June 9, Chavers will join a roster of women in Knoxville, Tenn. that includes players Tina Thompson, Chamique Holdsclaw and Katie Smith, coach Ceal Barry, assistant coaches Chris Dailey and Mickie DeMoss, and veteran and contributor Dr. Rose Marie Battaglia. All will be inducted into the WBHOF Class of 2018. As a former member of the Women’s Professional Basketball League (WBL), Chavers will be inducted as one of the “Trailblazers of the Game.” She played for three WBL teams, including the Minnesota Fillies, which was one of eight original teams during the first professional women’s basketball league in the U.S. from 1978-1981. “We knew we were doing something back then, but we didn’t look at it as…Hall of Fame level,” Chavers reflected of her WBL years – a domestic forerunner of the WNBA, now in its 22nd season. She didn’t play high school ball in the pre-Title IX era because a girls’ team didn’t exist at the time in her hometown of Memphis. “[I] hung around for two years [after graduating from high school] not doing anything but wasting time” until a friend suggested she enroll at LeMoyne-Owen College, which was starting a women’s basketball team. “Most [of] the ladies from my era were the first to get athletic scholarships,” Chavers pointed out. “The coach offered me a full scholarship.” She played at LeMoyne-Owen, but her hoop career was almost grounded even before it could start. Chavers later learned that Broussard had written a character letter to the judge, speaking on her behalf – a gesture she has not forgotten to this day as she prepares to enter the Hall of Fame. After playing one season of college ball, she said she opted for the WBL. “I wanted to see if I could play against the [Nancy] Liebermans, the Lusia Harrises, Ann Meyers, and all these people that I had heard about,” Chavers said. After the league folded, Chavers stayed in the area, earned two education degrees, and has taught in Minneapolis Public Schools for 27 years – 14 of them at Green Central. She was the district’s first Black female girls’ high school basketball coach at North High School in the early 1990s. Her Green Central office is adorned with hoop memorabilia, photos, Minnesota Lynx championship towels and other honors, including her 2015 Teacher of the Year trophy. She also is an unabashed Minnesota Lynx fan. As their unofficial ‘coach’ at home games, Chavers’ voice can be heard loud and clear. And now she is set to welcome one more honor – becoming a Hall of Famer. “I am really looking forward to seeing people I haven’t seen since 1981,” Chavers said, trying to stay composed. She expects her mother, family members and friends, high school and college classmates and other well-wishers to be with her during the festivities. “I am going to probably have the biggest contingent there,” she predicted. GREAT article about Ms. Chavez’s and the many accomplishments in her career. What an honor to receive in her hometown surrounded by family and friends.! Thanks for shining a light on this Unsong Hero working for Minneapolis Piblic Schools.. I love it! My coach. That was a fantastic article and I totally enjoyed reading it! It was so good seeing everyone in Knoxville and we have developed a sisterhood that I think so be unbreakable! Great job!